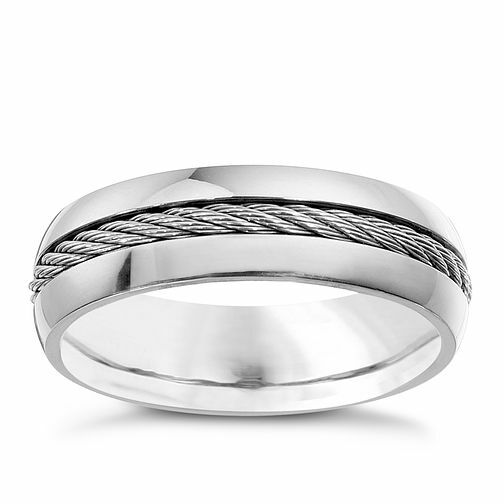 Men's titanium ring featuring central grey rope detail. A chunky and stylish men's design with a polished finish. Men's titanium grey rope ring is rated 3.7 out of 5 by 3. Rated 5 out of 5 by Anonymous from Love it Bought this for my man as an engagement ring. He loves it and so do I. Lovely and the quality is fab. Rated 1 out of 5 by Anonymous from Very disappointing. I purchased this item as a replacement wedding ring for my Husband. Unfortunately in 3 days normal domestic wear it scratched so badly we tried to return it as we thought it was faulty!